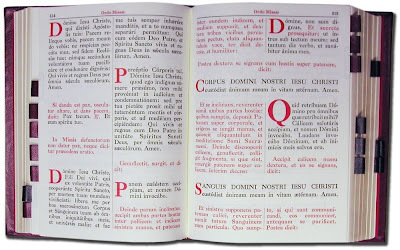 "Preserving Christian Publications" have announced the reprint of the Benzinger Brothers' 1962 Altar Missal. This looks to be a very fine quality Missal with gold embossing, reinforced spine, leather tabs, ribbons with mini-braid leads, leather tabs etc. The price is $460 which works out at £316 using today's exchange rate. to buy the Missal outside the USA, you have to contact them to check the cost of shipping. The media page has some photographs of the various stages of production. Many years ago, I used to be one of the few students at St John's Seminary, Wonersh who got the printing press in the basement going and actually printed off a few things like letterheads and business cards. There was some binding equipment down there and some old supplies - I managed to bind my "Daily Prayer" (the day hours of the English breviary) in half leather with red cloth and marbled endpapers. It wasn't the neatest job but the book is still usable after over 30 years. I don't use it much nowadays, having gone over to the old breviary, but it is a fine book to use when I am around to join in the Office at the Seminary. Since then, I have always had an amateur interest in the quality of books and it is good to see PCP keeping up the tradition of proper binding. 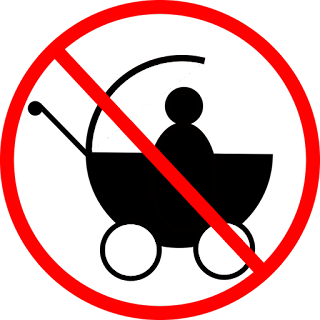 It needs to be said that in Britain at any rate, the quality of Missals for the Novus Ordo is utterly dire and the antithesis of everything that PCP have done - weak synthetic binding that falls apart quickly, poor quality "show through" paper that curls and crumples with use, poorly attached synthetic tabs that fall out easily, badly made ribbons with no leads, bland typesetting and layout: a combination that basically says "we don't care much about this." 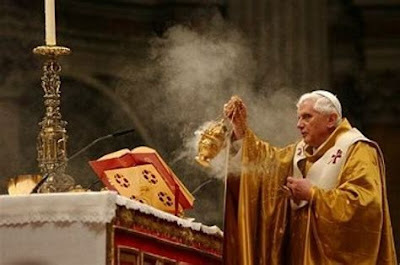 One area of "mutual enrichment" between the two forms of the Roman Rite must surely be the production of Altar Missals that look as though they are meant to be important and sacred books. It used to be that you could only find such books gathering dust at the back of sacristy cupboards. 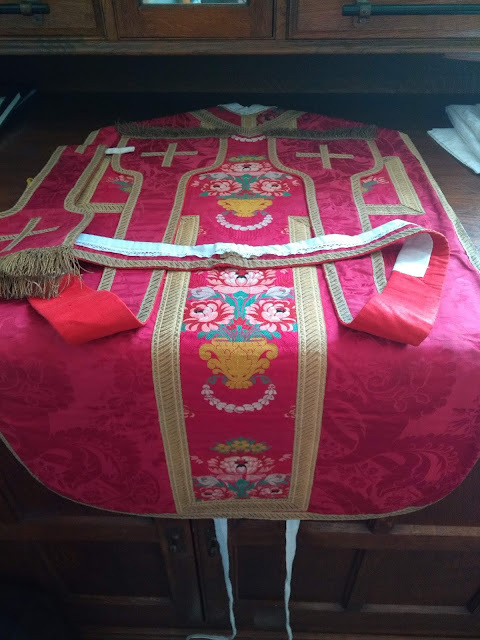 Now that new old Missals of fine quality are coming off the press (this one is not the first nor will it be the last), there is no excuse for not producing Altar Missals of similar quality for the newer form of the Roman Rite. Unless nobody thinks it is really worth doing.